Kangaroo Island trip with Makin Tracks. DASSA & Office of Sport & Rec. (Be Active) were also involved . Day 2. While other participants went fishing and hunting for the day, a few stayed back to watch and learn a skill that has made Aboriginal people so unique. A couple of elders showing and teaching the finer skills of Boomerang making. Everyone had a great time, plenty of fish and bush tucker to eat. Approx 85 Males attended the camp. These educational camps show that we dont need Alcohol and drugs to have a good time.Keep up the good work you mob. 4.	develop a strategic multi-agency plan for intervention with Aboriginal solvent and other drug misusers in the cross-border region during the second year. This evaluation report reviews activities for the 2001 � 2002 financial year and reports on progress to date on the project objectives. The report is based upon: internal self-assessment of process issues by project workers; and review of documentary data and unstructured interviews with project staff by the external evaluator. In the sections that follow, under each project objective, proposed outcomes are listed and a report on achievements with regard to each of the performance indicators is provided. Comments related to process issues are included under those outcomes to which they are most relevant. Develop a multi-agency plan for intervention strategies for Aboriginal solvent and other drug misusers in selected Aboriginal communities in South Australia within 3�4 months of the beginning of the project. Cooperation between a range of service providers and the Makin Tracks team in the development and implementation of community strategies to address substance misuse in selected communities. Establishment of a South Australian-based Steering Committee to identify key players in the development of intervention strategies for solvent misusers (within one month of commencement). As reported previously, this performance indicator has been met. The inaugural meeting of the Steering Committee was held in Alice Springs on 8th November 1999 and draft terms of reference for the Committee were presented to those in attendance. At a subsequent meeting, held in Adelaide on the 3rd March 2000, membership of the Steering Committee was finalised and the terms of reference for the Committee were formally adopted. Since establishment of the Steering Committee, members have provided comment upon, and endorsed modifications to, the objectives of the project and various documents, including the protocols for involvement in communities, project officer intervention strategies, and reporting data sheets. The Committee has also provided advice on the targeting of communities and on liaison with other agencies and working parties. During 2001 � 2002, the Committee met in Adelaide on two occasions�13th December 2001 and 21st May 2002. Committee members have kept the Makin Tracks team abreast of issues of relevance to the project and have been supportive of the team�s activities. 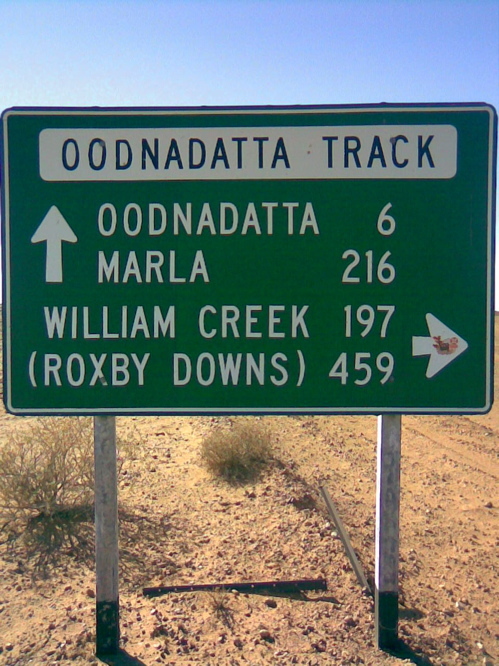 An updated version of the plan was endorsed by the project Steering Committee at a meeting in Coober Pedy on 7th May 2001, with positive comments being made about its potential usefulness for similar projects elsewhere. Commitments from the relevant agencies and service providers to cooperate in the implementation of the project. This performance indicator has been met. At a Steering Committee meeting in Adelaide on 4th December 2000, representatives of both the Drug and Alcohol Services Council and the South Australian Police indicated that their participation on the Steering Committee was evidence of their agencies� commitment to the project. Establishment of a mobile patrol to assist communities to intervene (prevention, early intervention and treatment) in solvent and other drug misuse. This performance indicator has been achieved�with the patrol being established in the first year of the project�s operation. In 2001 � 2002, the activities of the patrol were partially circumscribed as a result of staff turnover. Louie (Graham) Harradine resigned and completed his employment with the Makin Tracks project team prior to the commencement of the 2001 � 2002 financial year. Doug Walker also resigned in the previous year and was employed for only 14 days at the beginning of this year�during which time he was on annual leave. Their replacements, Jimmy Perry and Mindi (David) Crombie did not commence work until November 2001. After three months on the project, Mindi Crombie resigned in February 2002 and was replaced in early April by Sarah Betts. As a consequence of this turnover, staff were employed for a total of only 311 working days during the 2001 � 2002 financial year (compared to 468 days in 2000 � 2001). Following the May 2001 meeting of the project Steering Committee, it was agreed that the mobile patrol should focus its activities on a smaller number of communities. This decision was made for several reasons including: a need to provide greater levels of support to communities and/or agencies; to reduce the proportion of time spent travelling; and to reduce the periods in which patrol staff were separated from their families. The effect of this decision can be seen in Table 1. The total number of communities visited in 2001 � 2002 was nine compared to 15 in the previous year. The median number of days spent in each community dropped from eight in 2000 � 2001 to three in 2001 � 2002. This reflects the fewer days spent in most communities and the significant increase in time spent in (or at camps with the members of) two communities in particular�Port Lincoln and Yalata. Table 1 also shows that there has been a shift in focus from communities such as Whyalla, Point Pearce, and Dunjiba/Oodnadatta in 2000 � 2001 to Port Lincoln and Yalata in 2001 � 2002. The pattern of involvement with communities in 2000 � 2001 partly reflects the areas in which the team members then employed had extensive family/kinship networks. These networks are important and cannot be overlooked in projects such as this because their presence can facilitate the engagement of particular communities. The change of focus on communities is also a reflection of the younger age of the current workers and their ability to become involved in more �hands-on� activities in communities where there is a need for such an approach. Table 1 shows that despite the increased focus on a smaller number of communities, the percentage of working days spent in communities was little different in 2001 � 2002 (37 per cent) than it was in 2000 � 2001 (42 per cent). However, the amount of time spent in communities was spent more productively. This is reflected in Table 2 which shows an increase of 10 per cent in the number of days spent providing �hands-on� project assistance in 2001 � 2002 (17 per cent) over that in 2000 � 2001 (seven per cent). This increase was largely at the expense of a reduction in administrative work�some of which had previously been undertaken while staff were in the field. In the first year of the project approximately 30 percent of the patrol members� time was spent travelling or making travel arrangements. This was clearly related to the large number of communities visited in the establishment phase of the project. As Table 2 shows, in 2000 � 2001 travel accounted for an average of 18 per cent of working days and over the four quarters of 2001 � 2002 accounted for an average of 23 per cent. The reduction in the number of communities visited did not lead to a reduction in travel time. In part this was because the time spent in the communities of focus was increased by more frequent visits rather than longer visits (a not unreasonable strategy given the need to provide for staff members� personal lives), and in part because of the distance to Yalata in particular. Production of acceptable and appropriate resource materials for use at the community level. The production of acceptable and appropriate resource materials is an on-going task, towards which adequate progress has been made. In previous years, the Makin Tracks team developed a brochure describing the objectives of the project, the strategies to achieve them, and the background of the project officers. As part of a related project, ADAC also developed Petrol Sniffing and Other Solvents: A Resource Kit for Aboriginal Communities which is an integral tool in the Makin Tracks project. The kit has been distributed nationally, and in 2001 � 2002, the Makin Tracks team has promoted it, conducted workshops on its use, and was involved in the development of a training video on use of the manual. In conjunction with the Drug and Alcohol Services Council, ADAC staff have jointly produced information cards on cannabis and other drugs, a pamphlet on volatile substances and a hepatitis C prevention poster and calendar. As in previous years the Makin Tracks project officers have gathered and reviewed materials from other sources that might be of relevance to the project and its application in particular communities. This performance indicator has been met. In previous years, the Makin Tracks project team developed a document entitled �Project Officer Intervention Strategies� which outlines eight key intervention strategies and specific activities to be undertaken in furtherance of them. They also developed a set of protocols which clearly set out what the team will, and will not do, to assist communities. These are based on community development principles and have been incorporated into the brochure developed to publicise the project. Positive responses to resource materials and intervention strategies by community members, health care providers and others. This indicator relates to an on-going process and has been partially met. On the 30th June 2001 ADAC received a Ted Noffs� Award�a national award for exceptional work in the drug and alcohol field�for the Petrol Sniffing and Other Solvents resource kit. The positive response to this resource is also reflected in the high level of demand which necessitated a re-printing of the kit. The positive response to this resource is also reflected in the large number of requests for workshops on the kit and the fact that the previously mentioned video on its use had to be developed because ADAC could not meet the high level of demand for workshops. Positive responses to the Makin Tracks intervention strategies is also reflected in invitations to staff to contribute to an increasing range of activities such as youth activities in Yalata, support for a group from Yalata to attend a football carnival at Finke in the Northern Territory, and support for a men�s camp conducted in conjunction with Port Lincoln Health Services and Nunkuwarrin Yunti. Develop individual community strategies for intervention (prevention, early intervention and treatment) in solvent and other drug misuse as soon as possible but within time-frames set by individual communities. Individual community strategies for intervention in solvent and other drug misuse. Documented community strategies within 12 months of commencement�number dependent upon community participation. 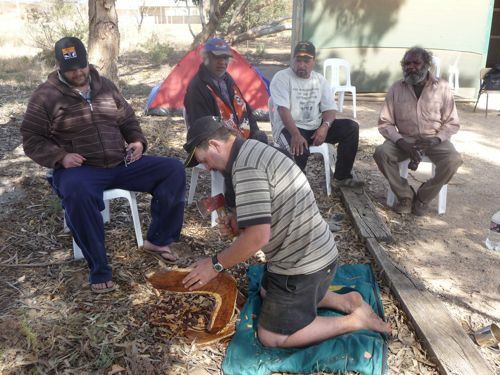 By January 2000, formal agreements to develop intervention strategies had been signed with Yalata Maralinga Health Service, Port Lincoln Aboriginal Health Service,	Point Pearce Aboriginal Community and the Dunjiba Aboriginal community. Despite these agreements being signed, the reality is that most Aboriginal community organisations do not work within such structured frameworks and it is unlikely that communities will develop the formal intervention strategies initially envisaged. Agreement of other communities to be involved in the Makin Tracks project is informally evidenced by their participation rather than the signing of formal agreements. 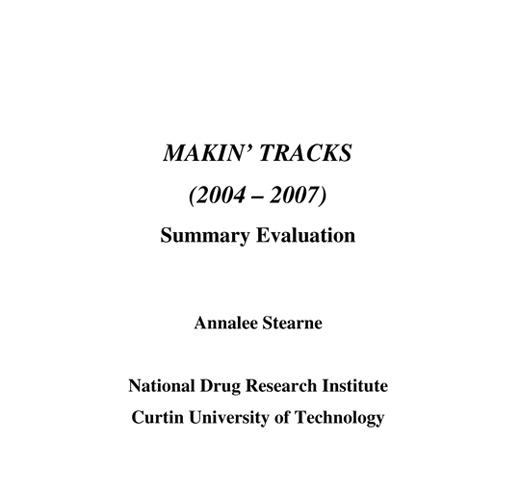 When the Makin Tracks project was established, it was envisaged that most of the team�s work would be undertaken in discrete Aboriginal communities. However, as the project developed, work was increasingly undertaken among people living in towns where there was no single agency, representing the whole community, with which formal agreements could be made. Reflecting this partially changed role, what is now Objective 3 was developed. Given both the reality of the way in which community organisations usually work and the changed role of the workers, formal agreements with community organisations are less relevant to the operation of the project. Accordingly, the Makin Tracks project team and the Steering Committee should consider the continuing relevance of this objective in general and this performance indicator in particular. A transfer of skills to the community, with an umbrella support, so that intervention plans are sustainable with limited government funding. Numbers of community members trained to access resources and deal with solvent and other drug misuse issues. In the past year the project team has conducted various promotional activities aimed at community members. However, given that practicalities are against the development of formal intervention strategies by communities, and given change of focus within the project to providing increased support to workers and established services, this performance indicator should be reviewed by the Makin Tracks project team and Steering Committee. Lessen the requirement for crisis funding to address solvent and other drug misuse, by having community intervention strategies in place. No increase in, or reduction of, the number of persons misusing solvents or other drugs in those communities where community treatment programs have been trialed. Positive responses to intra-community initiatives by community members, health care providers, and others. Given the change in focus of the project, it would be desirable for the Makin Tracks project team and the Steering Committee to review this outcome and the associated performance indicators. Provide support and/or training and general back-up for organisations and workers providing substance misuse services in selected communities. As indicated previously, this new project objective was included during the 2000 � 2001 financial year. As ADAC�s annual report and the reports of the project team members make clear, staff have been particularly active in this area. They have conducted workshops and informal training to substance misuse workers and to students from Flinders University of South Australia, the University of South Australia and Adelaide TAFE. Information on the effectiveness of these activities remains to be collected. Project team staff have also provided considerable support to substance misuse staff working at Yalata and Port Lincoln. Unfortunately, as they are currently written, the performance indicators relating to specific outcomes are not well matched, there appears to be some overlap between these performance indicators and those related to other objectives, and project team reports do not enable the outcomes to be examined in detail. The performance indicators should be reviewed by the project team and the evaluator to address these issues, and they should put to the Steering Committee and OATSIH suggestions for improvements in them and the way in which data related to them is collected. Increased effectiveness and skills of workers and organisations. Development of new programs and initiatives in selected communities. No specific performance indicators have been developed for this outcome. Provision of material and non-material resources to selected communities, organisations and workers. Quantity and quality of resources developed and distributed to communities, organisations and workers. Social/emotional support for workers, especially for substance misuse workers working in isolation. Length and intensity of contact with substance misuse workers in isolated settings. Develop a strategic multi-agency plan for the treatment of Aboriginal solvent and other drug misusers in the cross-border region during the second year. 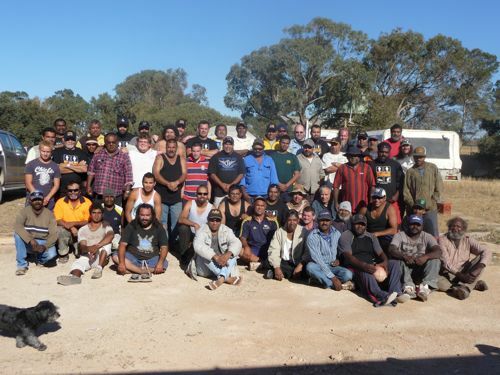 Members of the Makin Tracks team took initial steps towards this objective by visiting Mutijulu in the Northern Territory at the end of 1999 � 2000 and Warburton at the beginning of 2000 � 2001. One of the Steering Committee members also undertook some preliminary investigations into possible structures for implementing such a plan. However, since that time an inter-governmental committee has been established to develop a tripartite agreement on approaches to substance misuse in the cross-border region. This effectively precludes ADAC from independently developing an agreement between the relevant agencies. In the light of experience gained by the Makin Tracks project team, the Steering Committee has endorsed an implementation strategy focusing on reducing the amount of staff time spent travelling, and providing more intensive support to fewer communities in closer proximity to Adelaide. This strategy also effectively precludes the Makin Tracks team from achieving the objective. Given these factors, it is my recommendation that ADAC seeks approval from the Steering Committee to approach OATSIH with a request to delete this objective from the funding contract. As this report and ADAC�s annual report on the project indicate, the Makin Tracks project is dynamic and most objectives have either been fully or partially met. The objectives of the project, and the strategies developed to meet them, have evolved in response to: lessons learnt over the course of the project; opportunities presented; and the strengths and networks of particular staff members. As indicated in the body of the report, however, there are some that need further revision. Aboriginal Drug and Alcohol Council (SA) Inc is recognized by a Ted Noffs Award at the Annual National Awards held in Sydney. South Australian based Aboriginal Drug and Alcohol Council (SA) Inc work was acknowledged by receiving a Ted Noffs Australia 2001 Award at the Annual Ted Noffs Awards held in Sydney on Saturday 30th June 2001. 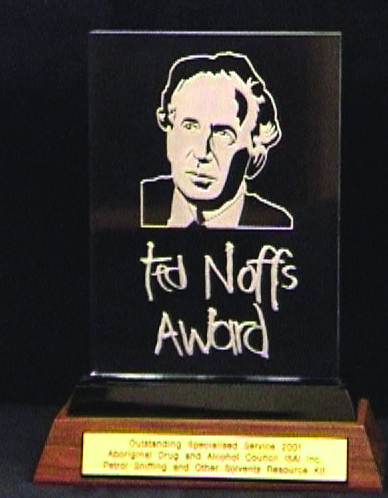 The Ted Noff Awards are an annual event hosted by the Ted Noffs Foundation to celebrate the life and vision and to honour the Rev Ted Noffs life long work in the drug and alcohol field. The purpose of the Awards is to acknowledge the exceptional work being done by individuals and organisations and to promote best practice in the drug and alcohol field. The Awards are the only national Award for drug and alcohol agencies and there are 6 categories. The Treatment Services Award, Organisational Award, Prevention Award, Individual Award, Youth Award and the Specialised Service Award. The Aboriginal Drug and Alcohol Council (SA) Inc was presented with the Specialised Service Award for the �Petrol Sniffing and Other Solvents Resource Kit for Aboriginal Communities�. out with information specific to Aboriginal communities. The Aboriginal Drug and Alcohol Council (SA) Inc recognising a gap in available resources applied to the SA Department of Human Services for funding to develop the resource. The Office of Aboriginal and Torres Strait Islander Health supported the Resource Kit with additional funding to enable Australia wide distribution.